Before our November 2015 cruise to Dutch Caribbean Island of Curacao, my wife Patricia and I made a decision to Pack for a Purpose. We chose to support the projects sponsored by the Santa Barbara Beach and Golf Resort on the Island of Curacao and deliver our supplies there. We made contact with Ms. Thysiara Gonet at the resort for an address and directions. Once our ship docked at the Island we hired a cab to drive us to our destination. We arrived within a half hour or less. Our bag only weighed 54 pounds with the donation supplies inside and that was no problem on a cruise ship. We were met by a friendly staff at the Santa Barbara Resort and made to feel welcome. They thanked us because the resort supports three projects on the Island of Curacao. Once we returned to our ship, we were asked did we go on a tour for the day. We explained that we Packed for a Purpose and delivered our donations. 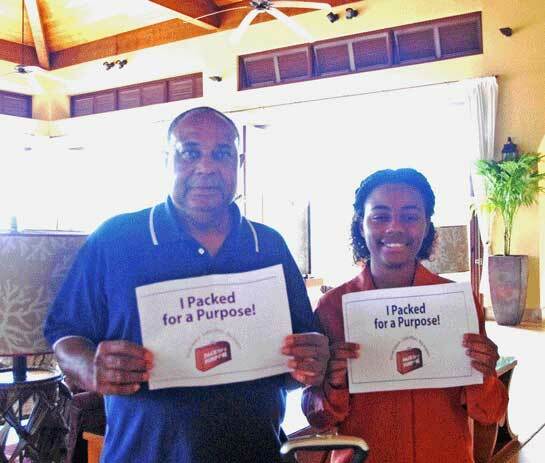 We were surprised to hear other travelers had never heard of Pack for a Purpose, some told us that on future cruises they “too” would Pack for a Purpose.